Evidence of salty water flows on Mars have been identified by NASA’s Mars Reconnaissance Orbiter. The researchers have examined unusual streaks found on the surface of Mars that change with the seasons - called recurring slope lineae. These streaks have now been analysed and found to show evidence of hydrated salt minerals that precipitate from water, while the surrounding area does not. The findings strongly suggest a link between the transient streaks on Martian slopes and the flow of liquid brines. On Mars, salts consistent with briny flows are present in enigmatic streaks that seasonally appear and fade away on slopes, according to a study published online in Nature Geoscience. These surface features — called recurring slope lineae — have been hypothesized to form by the activity of brines, but direct evidence has been lacking. Mars appears to be a cold, dry planet, but observations over the years have revealed streaks on the surface that come and go with the seasons. In this new paper, Ojha have uncovered the signature for salts in the streaks, critical evidence for the streaks having formed by flowing, or at least dribbling, water. As salt on your frozen driveway lowers the freezing point of ice, this briney remains liquid in the harsh conditions on Mars, allowing it to flow across the surface in the chill of a mid-summer on Mars. Many question remain, including what is the source of this briney water, be it locked up ice under the surface, or rarified vapours in the atmosphere, but this new result bolsters the argument for water on the surface of our planetary companion. This announcement is further confirmation of what has been suspected for some time, that ongoing interaction between Martian surface materials and water in the atmosphere play an important role in the surface processes of the planet. As pointed out by the authors, seasonal release of water to form dark streaks on steep slopes, the recurring slope lineae, perhaps by salts through a process called deliquescence, or by melting of seasonal ice, provides potential habitats for microbes. This makes these areas an important target for any future mission to search for life on Mars. The confirmation of the presence of perchlorate salts suggests that deliquescence may be more likely. We already know from other missions that the perchlorates are widespread on Mars, this may mean that potential habitable micro-environments are also widespread. Possible liquid droplets forming round salty soil particles were seen on the legs of the Phoenix spacecraft during its mission to the Martian Arctic in 2008, at the site where perchlorate salts were first deposited. As well as being a potential habitat for Martian life, such water-rich salts could, with appropriate planetary protection, also serve as a water source for human-crewed expeditions to the Martian surface. While the presence of liquid water on Mars was predicted given the river gravels, carved canyons and ice found previously, it is by no means an easy feat to confirm in the present day, particularly from orbit where images are available at a higher resolution than compositional (spectral) data. Nor would liquid water be expected to hang around at the surface given the Red Planet's cold temperatures, thin atmosphere and low atmospheric pressure. Using new methods, today's results verify that particular locations and conditions - salty brines which seasonally wax and wane along gullied slopes - harbour water in liquid form, at least ephemerally. Because water is essential to life as we know it, the finding is important for extra-terrestrial habitability studies. The results compare favourably with Earth-analogue extreme environments of the ultra-dry Atacama Desert in Chile, where microbes living in salt crystals can survive on tiny amounts of water absorbed directly from the atmosphere. Of all the worlds we've explored, water flows only on the surface of one - ours. Which is why the discovery that water is now likely to be regularly flowing across Mars is so stunning. Dark streaks in the Martian soil appear to contain hydrated (ie water bearing) salts as seen by NASA's satellite, the Mars Reconnaissance Orbiter. These strongly suggest that these seasonal features are linked to salt water after all. NASA is guided in its science by ‘following the water’ as where there's liquid water there's life. The brine on Mars might not directly support life but it suggests that the arid world isn't as dry as once thought. We can't tell if there's life there yet but these dark streaks can tell us where to search in future. Was the presence of liquid water expected? Yes! In fact we've known for some time that liquid water exists on Mars. The major thing that has come about in the past 2-3 years is the recognition that there is a huge amount of 'salts' (in particular perchlorates) in the Martian soil/surface layers, and the fact that these dissolve in water and drop its freezing point significantly is a new recognition from the past - several years. The present paper builds on this by explaining - to some extent - the 'rivulets' or lineae seen on Mars, mostly at the foot of cliffs. These have been a puzzle, because we had not expected so much liquid water as is evidenced by these active stream outlets. A proposed NASA mission in which I am involved, Icebreaker Life, for launch in 2020 would do just what its title says: break through the top layer of ice/permafrost, and see what is below. What do the current findings mean for our understanding of the potential for life on Mars? Liquid water is the sine qua non of life on Earth, and so we look for it elsewhere (on Mars; under the ice of Europa; erupting on Enceladus). Also, the perchlorates are strong oxidising agents, and so count against life, as such. There is much we must yet understand. There is certainly life in very salty environments on Earth, and studying extremophiles is a big thing. Indeed NZ has various extreme environments of great interest in this regard, for example hot sulphur springs. An observation of salty liquid water flowing across the Martian surface is extremely significant. Liquid water is not stable on the Martian surface in the present day, due to the low atmospheric pressure and cold temperatures. Water ice is the dominant phase of water observed on Mars, but even this is restricted to near polar latitudes where the surface temperatures are cold. The regolith at low latitudes is thought to be predominantly dry and inhospitable to life. Some scientists have challenged this view however, proposing that salts in the Martian soil could allow sufficient volumes of liquid water to accumulate in the shallow soil. Salts can 'absorb' water vapour from the Martian atmosphere during high humidity, or can cause melting if in contact with water ice. Salts lower the freezing point of water, allowing salty water to remain a liquid at temperatures below zero. I can simply say that the potential presence of liquid water on the surface of Mars is incredibly exciting because water is essential for life as we know it to exist. More work is needed to understand how exactly these seasonal salty water streams are formed on Mars, but the new evidence for water flow is certainly an exciting step forward in understanding water activity on Mars. The recent findings are incredibly exciting as they are evidence for the presence of liquid water on the surface of modern day Mars. The water is only present for short periods of time and is seasonal in nature. However this transitory water is chemically incredibly caustic, containing perchlorates and other dissolved salts which are probably responsible for lowering the melting point of water sufficiently for it to be present in the summer. With the exception of some very rare extremophiles, such solutions are quite toxic to most forms of life on earth and hence are unlikely to harbour life as we know it, although the presence of water, even if transitory and highly salty, is greatly encouraging in this search. This is the first proof that moving ‘liquids’ on Mars’ surface are made of water, albeit extremely salty brines. These are likely to be ten times more salty than sea water here on Earth and so a human would actually receive burns from contact with these brines. However, extremely salty lakes that occur in many desert environments from California to Tibet do support simple microbial life that can tolerate this high salt content – and so this new study suggests this may be the sort of extant life we could expect on Mars. These microbes often colour the water vivid pink due to a pigment they contain called bacteriorhodopsin, and I think that many scientists may now start considering this as a potential ‘biosignature’ molecule for life on Mars. 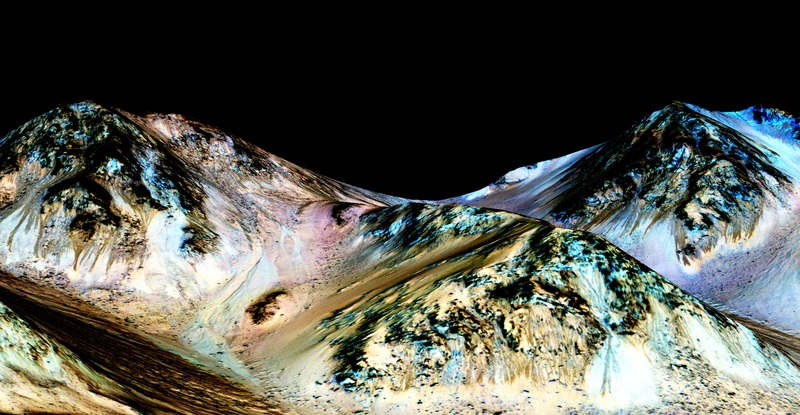 The discovery of moving water on Mars would really add momentum to the search for life. When water moves there is the opportunity for weathering of minerals and creation of nutrients to sustain life. Any Martian life would also be able to use flowing brines to disperse and colonise new areas of Mars surface. There is however still a major problem that still faces any potential life in these brines and that is the inescapable radiation on Mars surface. Mars has high levels of ionising radiation because it only has a very thin atmosphere, unlike Earth’s thick atmosphere that shelters us and allows life to thrive. The only real option on Mars is for life to colonise beneath rock surfaces in what is known as the ‘microbial cabana’ strategy that was first proposed by myself and American colleagues to explain how microbes could colonise Mars. Microbes can only do this in weathered rock, and flowing brines would certainly be a good weathering agent, so even if we do not discover little pink microbes in the brine itself, it adds to the possibility of finding other photosynthetic green microbes that form the microbial cabana in Mars-like environments on Earth such as the Dry Valleys of Antarctica. This expert list has been collated by the Science Media Centre to provide a variety of expert perspectives and reflect independent opinion on this topic. Honorary_Professor Malcolm Walter The University of New South Wales Geology, palaeontology, early life marsastrobiology.